The tranquility of nature! A snowshoeing hike! If you want something quieter than the snowmobile tours or dogsled, if you want to take your time and observe the nature that surrounds you, then you have at your disposal a system of snowshoe rental that will surely bring happiness to everyone. 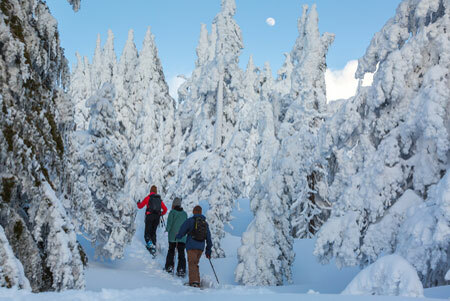 So you can rent a pair of snowshoes and we will provide a map of the walking paths. You can go on an adventure to hike a maximum of 3 hours. You will be alone, you will have all the peace you can dream and all at a low cost. Therefore, if you want to get away from your stressful everyday life, to take a well deserved break, go ahead and relax in the forests of Lac Beauport! It is great fun to look far or near departures sled dogs and look near the lake children slip and those who enjoy a few minutes of rest inside the teepees of hay bales. You can take a break in the warm reception pavilion of the outfitter and enjoy the opportunity to enjoy a hot drink to warm you up. Our guides are always on hand to welcome you, advise you and help you need. Service equipment rental and shuttle transportation are also available. **Note: our prices are subject to change without notice. Deposit of $ 50 per pair of snowshoes in case of breakage or theft.